Stream capture by headward erosion, leaving a wind gap. 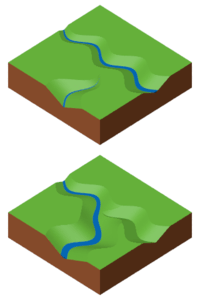 Schematic Representation of River Capture. After streams have started their journey and finally plunge into the ocean many things may happen. One of these happenings is the river capture or stream piracy. River capture is very common in such regions as are characterized by folded rocks. Natural damming, such as by a landslide or ice sheet. Within an area of karst topography, where streams may sink, or flow underground (a sinking or losing stream) and then reappear in a nearby stream valley. The additional water flowing down the capturing stream may accelerate erosion and encourage the development of a canyon (gorge). The now-dry valley of the original stream is known as a wind gap. About 25,000 years BP, an uplift of the plains near Moama first dammed the Murray River and then forced it to take a new course. The new course dug its way through the so called Barmah Choke and captured the lower course of the Goulburn River for 500km. The original course of the Murray River was to a mouth near Port Pirie where a large delta is still visible protruding into the calm waters of Spencer Gulf. An uplift of the land blocked the river near the southern end of the Flinders Ranges, and the river eventually found its way to a new mouth near Lake Alexandrina. The River Thames in southern England originally entered the North Sea near Ipswich. About 450,000 years BP, an ice sheet expanding from the north pushed the course of the river southwards, forcing the Thames to cut a new mouth where the mouth of the River Blackwater, Essex now is, north of London. It later moved southwards again to its current position as a result of cutting through the Chiltern Hills at Goring-on-Thames, an event which created the Goring Gap. The Teays River, captured by the Ohio River. The Rio Grande which before capture flowed into a closed basin, Lake Cabeza de Vaca, but after capture flowed into the Gulf of Mexico. The River Stour, Kent, largely captured by the River Beult /ˈbɛlt/, River Teise /ˈtiːz/ and others. The River Wey, in southern England, the western arm of which is the former upper waters of the River Blackwater (River Loddon). The River Rheidol in Wales which has captured the headwaters of other streams and now runs for part of its length in a deep gorge. The River Lyd in Devon, England. The Donauversickerung (Danube Sink), currently developing in Germany, where a large portion of the upper parts of the Danube river sinks into the limestone bedrock, and resurfaces in the Aachtopf spring, a tributary of the River Rhine. According to Woodridge, river-capture does not need special structural conditions to occur. As a matter of fact, river-capture is a normal incident in a struggle for existence between rivers. In reality, the development of contiguous river systems must lead to one river becoming more powerful than its neighbours; slowly it becomes the master stream of the area. It is accomplished by watershed- regression and diverting part of a nearby system into its basin. This entry was posted in plate tectonics, Rivers, topography and tagged CLIMATE, Environment, nature, science, stream piracy, transportation. Bookmark the permalink.